Corrugated cardboard is the term given to a special kind of cardboard used to make packaging boxes. 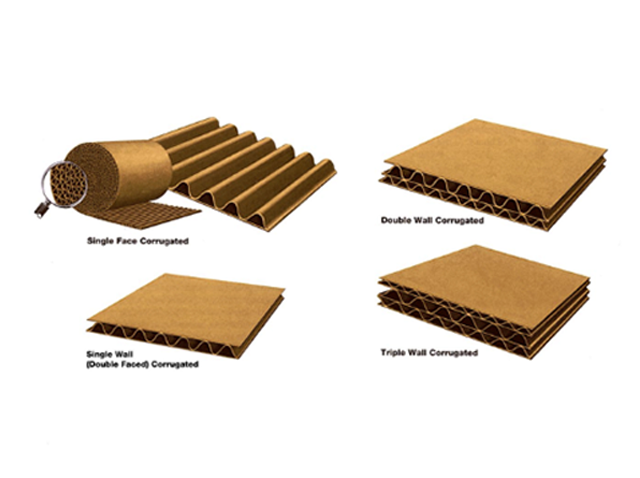 Corrugated board differs from regular cardboard because it contains a corrugated sheet in between 2 flat liners. It all begins with a “Medium” roll (The medium is the thick, flat paper). This paper is directed through a flute roller to be pressed into waves (from this point on, the medium role is referred to as a “flute”). Glue is then applied to each side of the flute and pushed forward together to meet an outer liner and an inner liner. Using a hot box, the glue seals the flute to its outer and inner liners to produce a sturdy board, ready for the wear and tear of shipping (the flute does two things for the board. For one, it adds an extra layer of box to protect the products inside. For another, it allows air to help cushion and support the products inside). In certain instances, when the box needs to handle more than the average corrugated box, the machine will double layer the final product, making the end result more sturdy and durable for heavy duty packaging requirements. Cardboards first discovery was a complete accident, the accident occurred by a printer and bag maker named Robert Gair in the late 1800’s. In a strange turn of events, he accidentally cut a paper bag he was trying to crease with a metal ruler. He then discovered that he could both cut and bend his paper into a box. As time went on, he got into corrugated shipping and made himself an empire for the time.